Large open pores on the skin are not only a matter of beauty concern but can also contribute to many skin problems like acne, zits and blackheads, especially for people with oily skin. As people with oily skin tend to produce excess oil(sebum), leading to open pores in areas like nose, cheek, chin and forehead at times. Excess sebum, along with dirt and bacteria, tends to clog the pores. These clogged pores not only make pores more visible and look even larger but may also lead to blackheads, acne and zits. Prolonged and over exposure to sunlight, hormonal imbalance, improper cleansing of skin, oily surface, improper use of wrong cosmetics, genetics and stress are some common causes behind large open pores. Though there are several cosmetic products in the market to deal with this problem, before you go to purchase these products you can try some inexpensive, easy and natural home remedies to minimize the appearance of open pores and get a soft and smooth complexion. To reduce and shrink your large open facial pores you can prepare a mixture pf Lemon Juice and Rose water. Both of these ingredients act as natural skin toners and helps a lot to close open pores. Take equal amounts of lemon juice and rose water. Apply this mixture on the affected areas at least for for 15 minutes and then wash off with fresh water. A mixture of Fuller's earth, honey and milk is also very beneficial in reducing the size of large open skin pores. Mix 2 tablespoons of fuller’s earth (multani mitti) with 1 tablespoon of honey and 1 teaspoon of milk. Mix all these ingredients well, and then apply this mixture all over your face. Leave it for 15 minutes and then wash your face with fresh water. A mixture of cucumber juice and rose water is considered very effective to reduce open pores. Mix 1 teaspoon of cucumber juice with 1 teaspoon of rose water. Mix them well and then apply this mixture on affected areas at least for 20 minutes. Finally wash off with fresh water. Aloe vera gel is also very effective in getting rid of large open pores. Aloe vera gel has skin cleansing properties and enzymes that will help you to eliminate impurities from face and seal your skin pores To enhance the effect of aloe vera gel you can mix with some lemon juice. Take 1 tablespoon of aloe vera gel and mix with 1/2 teaspoon of lemon juice. Apply this mixture all over your face and rinse off after 15-20 minutes. Ice cubes are considered an instant remedy to close large skin pores. With help of ice cubes you can shrink your large pores before you apply your makeup. This will instantly shrink the size of the open pores and help in leaving the skin smooth looking and also prevent the makeup from entering the big pores thereby reducing the risk of clogged pores, acne, and infections. Put ice cubes on the large open pores and leave them there for fifteen to thirty seconds. After few seconds repeat this for same time period. 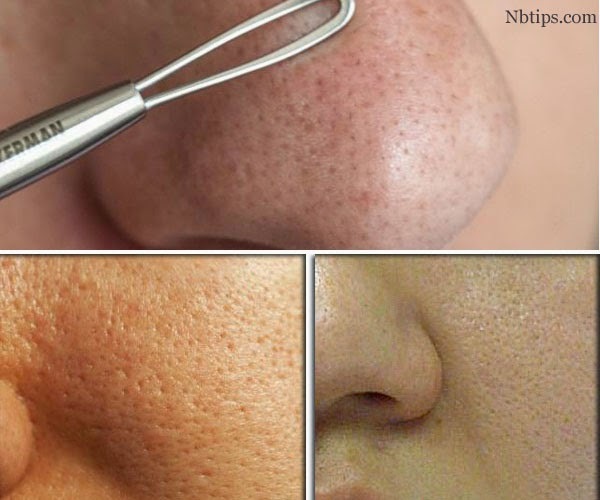 This will not only help in shrinking large skin pores but will also help in tightening of skin. A face mask prepared by egg white and lemon is also very beneficial in minimizing the size of large open pores. Take one egg-white and 1 teaspoon of lemon juice, mix them well and apply this mask all over your face. Leave it on the face for at least for 15 minutes and then wash it off. A mixture of tomato, sandalwood and lemon juice is also very effective in getting rid of large open pores. Make a paste by mixing 1 tablespoons of tomato juice, 1 teaspoon of sandalwood powder and 1 teaspoon of lemon juice. Apply this paste on affected areas and rinse off after 20 minutes. Carrot juice is also very beneficial to shrink large pores. Carrot eliminates dead skin cells, improves complexion and tighten skin pores. They are loaded with Vitamin A that helps you to get rid of large, open pores and acne on your face. Place few carrot slices into the blender and blend using little rose water. Place this carrot juice of rose water into the refrigerator for 3-4 hours. Now gently apply this mixture on your face. Leave for about 20 minutes and then rinse off using cold water. Mix equal amounts of baking soda and rose water in a bowl. Now gently apply this mixture on affected areas. Baking soda removes excess oil and dirt that get deposit in your skin pores thus minimizing the appearance of large pores. It’s neutralizing compound neutralizes pH imbalance of your skin that causes large pores. This mask is very helpful in oil controlling and pore tightening.This mask deep cleanses blackheads and unwanted residues from your skin pores thus leaving them clean and less noticeable. To prepare this mask mix an egg white and 2 tablespoon of clay mud in a small bowl. Apply the mask to your face with the help of a brush. Leave until it dries completely and then rinse with cool water. Mix one teaspoon of honey in the juice squeezed from one lemon. Apply this mixture all over your face, and leave it on for 15 minutes before rinsing it off. Regular application will give you an excellent result within few days. Apple cider vinegar works as a natural toner and reduces the pore size. Mix apple cider vinegar and water in equal quantities and with help of brush or cotton ball apply on your face. Leave there at least for 15 minutes and then rinse off. Tea tree oil is also considered very effective to reduce the size of large pores. It’s antibacterial properties disinfect the skin pores and cures acne, pimples and make pores appear smaller. Pour few drops of tea oil in your palms and gently massage into the skin for 5 minutes. Leave there at least for 15 minutes and then rinse off. Witch hazel is a a natural astringent and helps a lot in getting rid of large open pores. First of all wash your face and pat the skin dry. Take 1 teaspoon of witch hazel and with help of cotton ball apply it to your face. Allow it to dry and then wash off. If you have dry skin, dilute one part witch hazel with two parts water. Leave this on the face for 10-15 minutes and finally wash off with fresh water. Now pat dry your skin with help of clean towel and apply good moisturizer. Yogurt is very effective for tightening the skin pores and in getting rid of blemishes on face. Yogurt has lactic acid that helps reduce pore size, tighten skin, eliminate dead skin cells, and reduce excessive oil and dirt from the pore openings. A mixture of yogurt and oatmeal is very helpful in minimizing the size of large open pores. Mix 2 tablespoons Oatmeal with 2 tablespoons of yogurt and place it in the refrigerator for 2-3 hours. Then apply this paste all over your face at least for 30 minutes and then wash off with lukewarm water.